Grate the potatoes and onions and squeeze out excess water with your hands. Put in bowl and stir in three quarters of the bacon strips, the sweetcorn and beaten egg. Heat 2 tsp of oil in a large, heavy based frying pan. Spoon 4 equal piles of rosti mix into pan and press each down with spatula. Cook for about 3 minutes each side, till golden brown. Remove from pan and keep warm. Heat remaining oil in the frying pan and add rest of bacon. Fry until slightly crispy. While the bacon is frying, steam the Savoy cabbage until just tender. 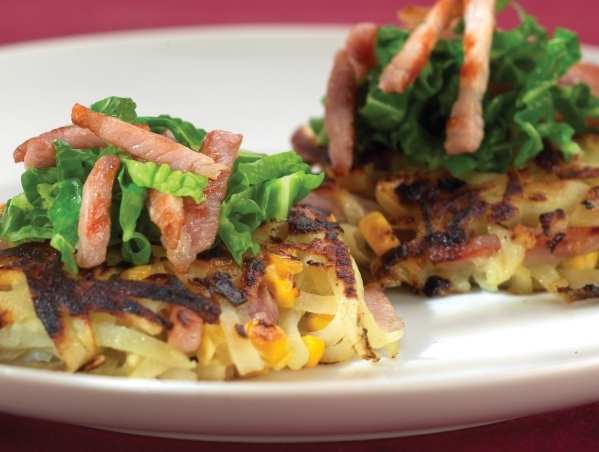 Put each rosti on a serving plate and pile on shredded cabcage and then the remaining bacon on top.